NHPPA is keen to continue our public outreach and educational efforts across our country by duplicating our work in three or more cities across Canada in 2018. 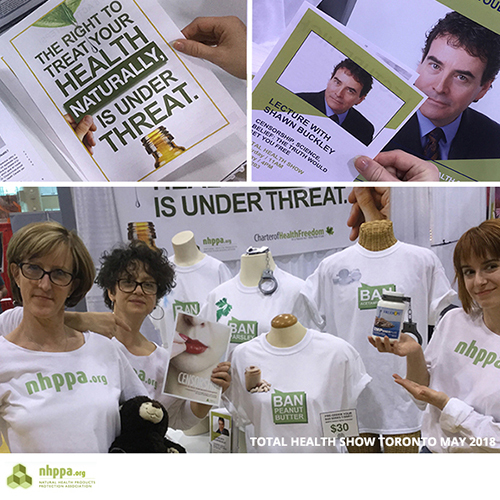 This May, at the Total Health Show in Toronto, we reconvened with many prominent freedom fighting allies and produced new materials that brought into question the intentions of Health Canada’s most recent proposed NHP Regulations. The Show Report and Photo Gallery highlights our influential activist friends, links to new handouts that can be shared and the work we do at the shows to make an impact. We would welcome your suggestions for similar shows to the East or West of our headquarters in Ontario. What consumer shows would you like to see Shawn Buckley and NHPPA attend this year? Email us at info@nhppa.org with your recommendations.